RICK WARREN REINVENTS THE PURPOSE DRIVEN LIFE MACHINE: WHAT ON EARTH AM I HERE FOR? By Apprising Ministries special correspondent and Christian Research Network contributor Jim Lupacchino of Watcher’s Lamp. 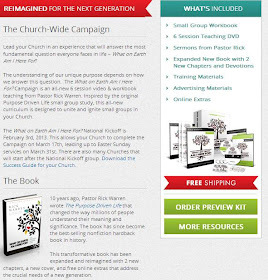 Rick Warren has announced the new church growth marketing campaign “What on earth am I here for?” in honor of the 10th year anniversary of his record selling book, The Purpose Driven Life. Warren even offers a Customer Care department, the toll-free number is 1-800-SADDLEBACK (723-3534). From Warren’s video: ” I want to talk to you for just a few minutes about how you can help your church be stronger, healthier, more stable and experience exponential growth. …I am often asked by people…what’s the single most important ingredient in the growth of Saddleback church…It is the power of the annual campaign. I began to think, What are all the things i have learned in the last 10 years? …Out of that emerged a whole new series, a whole new small group curriculum, several new chapters for the revised and expanded version of The Purpose Driven Life. …Then I went back and began to write new sermon outlines…all that I learned about worship, fellowship, about discipleship, ministry and evangelism. I will be sharing these sermons with pastors as they do this campaign together. TV SHOWS NEXT WEEK! In preparation for our completely new What On Earth Am I Here For? campaign in January, I travel to New York City next week for a couple of days of media interviews. Please pray for me as I will be a guest next Tuesday and Wednesday on… CBS THIS MORNING … FOX & FRIENDS … CHARLIE ROSE … CNN PIERS MORGAN … HANNITY …and several other TV shows. 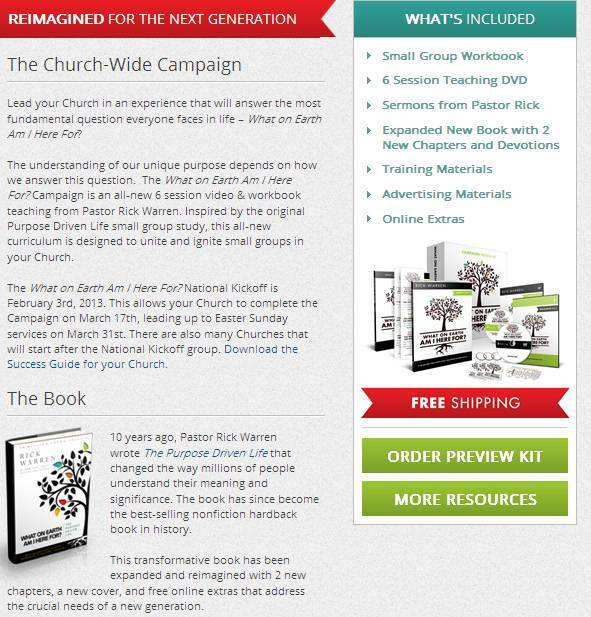 Editor’s note: It has been said that what you hook them with, is what you need to keep them with… Rick Warren’s rebranding of his spiritual product line proves he is no exception to the rules of mass marketing.